On a night when many corps moved up or down in the rankings, the Cavaliers of Rosemont, Ill., rose above the scuffle and maintained their first-place status to win the 2006 DCI Division I World Championship with a final score of 97.200. The Cavaliers' director Jeff Fiedler was very happy with the result. "A lot of good performances obviously caused some decision-making, and we had a great performance ourselves, so when the dust clears, we wind up on top," he said. "But it's a good feeling no matter what. It's a good feeling for this group of students – some of them have never experienced this." Pat Seidling, director of second-place Phantom Regiment from Rockford, Ill. (96.850), was also very pleased with his corps' efforts. "It's humbling, actually," he said. "Phantom Regiment has had some really great second places – 1977, 1978, 1979, 1989. And really, it says we're back to the level of being a championship-quality corps. To be up there with Blue Devils and the Cavaliers is a humbling place to be and it's no easy feat, so it's really honorable. It's kind of cool to be here with that again." Fiedler felt that his corps' internal focus helped keep the tight scores of the last few weeks from becoming a distraction. "We had our focus, and our focus was on our performance," he said. "When you're in the lead, you've got a target on your back, and you don't look back. You just look at what you've got to do, and that's what we did." The corps succeeded the old-fashioned way – through hard work, Fiedler said. The corps' success from year to year, though, is due to "talented members, talented staff, and just a great support crew. We are lucky to have the people we have," Fiedler said. "With the students we attract and continue to attract, and the retention – we had 90 guys back this year. That experience speaks a lot and speaks very loudly. We have 45 guys graduating this year and 90 that could come back next year." With their 2006 program "MACHINE," the corps dazzled audiences with the innovative design that has become a hallmark of recent Cavaliers programs. The pressure on the corps, Fiedler said, is not to keep winning, but rather to keep shows new. "I think in some ways, we feel that winning almost demands us to do something different, to not have a formula, to break the mold. That's what we feel our responsibility has been for the last number of years," Fiedler said. "We're going to do something new next year. We're going to zag. We're going to zig some years, then we're going to zag. And I think people are starting to have confidence that no matter what we say we do, it's going to be something that we've never done before." The design staff lives up to the expectations by staying open to each other's ideas. "Anybody can talk about anything," Fiedler says. "The visual guys can talk about the music, the brass guys can talk about the visual. The percussion guys can talk about the flags. And we just leave it to that kind of open discussion." The Cavaliers were also the recipients of the annual Spirit of Disney award for the program that best translates imagination into an educational and fun forum for all participants, as well as the brass, visual, and general effect caption awards. For Fiedler, the Spirit of Disney award is a particularly special accolade. "[Disney's] got just incredible innovation all over the world, and for them to even be here at the World Championships is something that DCI should feel proud of," he said. "So it's just great that they're recognizing that we're doing something special in the world of pageantry." 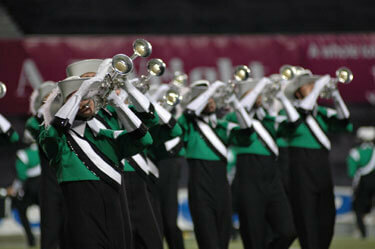 Fiedler indicated that the Cavaliers have plenty for drum corps fans to look forward to in the months and years to come. "We have a couple surprises, and we're working on that. We're working towards our 60th anniversary in 2008. We're very much looking forward to going to Pasadena [for the 2007 World Championships], and that'll make everything different, so everybody I think is looking forward to a different summer next year." While the win tonight was special, Fiedler said, it was the result of dedication throughout the year for everyone in the organization. "The guys work hard, the staff – just incredible work on their part, and the volunteers," he said. "Everybody put their work in. The journey's what it's all about, you know, and tonight's just the icing on the cake of a great journey."